Where are we going again? Psst … True 3D History in Munich … pass it on … Click Here To Comment! I had some plans change at the last minute and found Taff by googling something like “what to do in Munich”. We had an email exchange and he wound up adding me to the end of his long day of group tours for a quick walk around downtown in the early evening. This was above and beyond, in my opinion, and I learned more in that short few hours than ever expected to. I peppered him with questions on such a wide range of historical eras – from ancient tribes in the area to WWII – and he fielded them all. Taff is a trained and experienced archaeologist and historian with a clear passion for all things historical. They don’t make them like this anymore. We stopped for a beer – everyone drinks beer in Munich – in the oldest pub in the city. 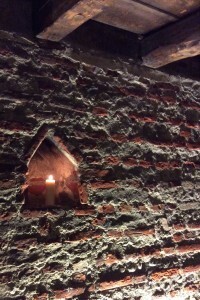 These bricks were hand formed over 600 years ago – some of the finger impressions in the bricks are still visible. I learned more new facts about the rise of National Socialism in Munich, including the early location of the Gestapo headquarters and the dining hall where Kristallnacht was likely planned and set in motion by all the leading Nazi figures of the time. Other tours take some of the standard approaches, and these are key too – the Beer Hall Putsch, the locations of early Nazi rallies, the struggle of today’s citizens of Munich to acknowledge their city’s dark role in the establishment of the roots of Nazism. Taff adds extra detail to flesh out these elements and make them come alive. In one of the courtyards towards the end of our tour, he demonstrated what a medieval man of status would look like, pulling out costume items and accessories, all the while discussing the whys and wherefores of each item. The courtyard we were in has historical significance through many periods of time, including being used as a marketplace where men in his style of dress would have been present. It was engaging, fascinating and fun. Taff is obviously a walking 3D History Channel and it is worth a detour to Munich, if you hadn’t planned to be there, just to hang out with him. If you are planning some time in Munich, you must look up Taff Simon and Dark History Tours. You will not regret it.